A field microscope is a simple stripped down microscope device that's almost good enough to use for mounting and cleaning specimens. But I wouldn't call it ideal. Almost being the operative word - I personally find that my stereo microscope makes things much easier but before I had that I only used one of these. A field microscope, a simple stripped down microscope device that's almost good enough to use for mounting and cleaning specimens. Carding specimens on this field microscope was quite a difficult exercise more I think due to the fact that there is only one lens than any other factor. For whatever reason seeing them in stereo makes it orders of magnitude easier. 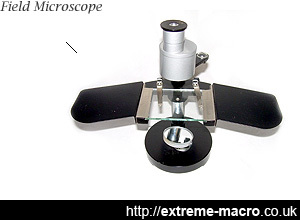 Unlike a full microscope a field microscope is more like a small single lens construction that sits over a small 10cm² table that is further increased by adding on side panels. The field microscope usually come with various magnification lenses so in terms of something portable to use in the field it would appear to be quite useful. A further exercise to try would be to use these lenses to take an extreme macro shot but they're not achromat so I'm not holding my breath. Where it slightly fails is that it has no integrated light source and relies either on natural light lighting your specimen or shining a lamp onto it. That maybe great in the field where you can rely on the sun but using it inside isn't all that great. But that's probably being a bit picky, and in the absence of anything else I would rate one of these as pretty much ok to prepare specimens, but not great. Preparing specimens on this field microscope was quite a difficult exercise more I think due to the fact that there is only one lens than any other factor. For whatever reason seeing them in stereo makes it orders of magnitude easier. Beyond this I suspect that this field microscope is perfectly ok for its intended use, namely in the field. I have a wooden case left over from the old turn of the century one that I initially broke but bust, so I can pack it all away nicely and have it in the boot of the car for as and when I might need it. Which, to be honest, isn't all that often. So all in all it makes a great doorstop or ornament on the shelf but its actual utility has been superceded by the stereo microscope I now use instead.